Early Glow Strawberry Preserves for sale. Buy online at Zingerman's Mail Order. Gourmet Gifts. Food Gifts. A rare variety of berry, made in Michigan. As Justin Rashid, founder of American Spoon says, “Fruit is about seduction. If you just want a gummy, sweet paste, any brand of jam will do. But if you want a flavor experience, you have to buy a great preserve.” What makes this particular strawberry preserve so special? For starters the variety of berries. 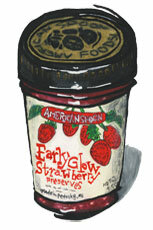 While only a few strawberry obsessed gardeners will recognize Early Glow by name, they’re special. Much smaller than your typical strawberry and apparently a bit fickle about ripening, their yields are quite low. Strawberry season in Michigan is shamefully short, even more so for these. Not surprisingly, few farmers choose to grow them. Since they started making jam in 1982 Justin and his crew at American Spoon have bought all their Early Glow strawberries from the same farmer, who raises them on his centennial family farm in the heart of the Leelanau Peninsula. The preserve is berries with cane sugar only—no fructose, no corn syrup, no dextrose, no pectin. The fruit ratio is exceptionally high, about 60 percent. Enough about the details. The aroma is amazing. The flavor lingers long. This is as good a strawberry jam as I've ever had. Nuff said.